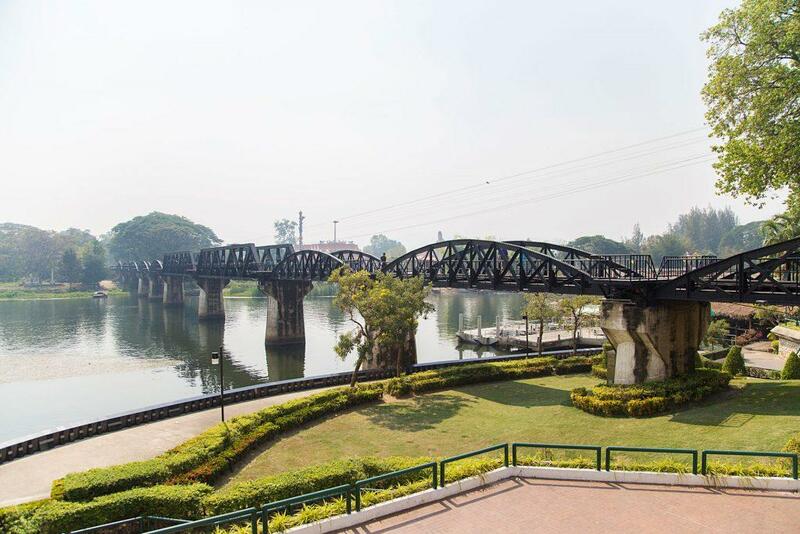 One of the most popular day-trips from Bangkok is a visit to the town of Kanchanaburi to see the famous Bridge over the River Kwai immortalized in the 1957 movie The Bridge on the River Kwai. Kanchanaburi is just a few hours from Bangkok by train, bus, or van. You can either join an organized tour or make your own way there and back by public transport. 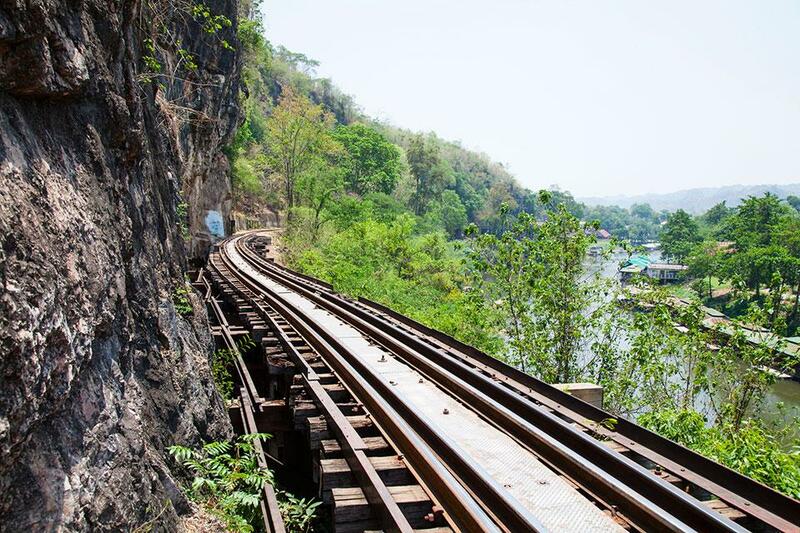 Most sights in Kanchanaburi revolve around its WW2 history and apart from the bridge, there are three war museums, two war Cemeteries, the death railway, and the infamous Hellfire Pass. Kanchanaburi also has some beautiful temples, waterfalls and great natural scenery in the vicinity. The main point of interest is the Bridge over the River Kwai which was part of the infamous World War 2 Death Railway to Burma constructed by prisoners of war many of whom perished in the hellish conditions. The Curve shaped truss spans on either side are the originals from WW2 while the central part was rebuilt after the war as it was destroyed by aerial bombing. You can walk across the bridge via a walkway between the tracks and ride across on a tourist train. The bridge is still in everyday use as part of the Bangkok-Nam Tok line. There are tourist trains to Nam Tok stopping at stations in between daily from the River Kwai Bridge station at 06.05, 11.00 and 14.30. Return trains are 12.55 and 15.15. Tickets are 100 baht. Pay on the train. 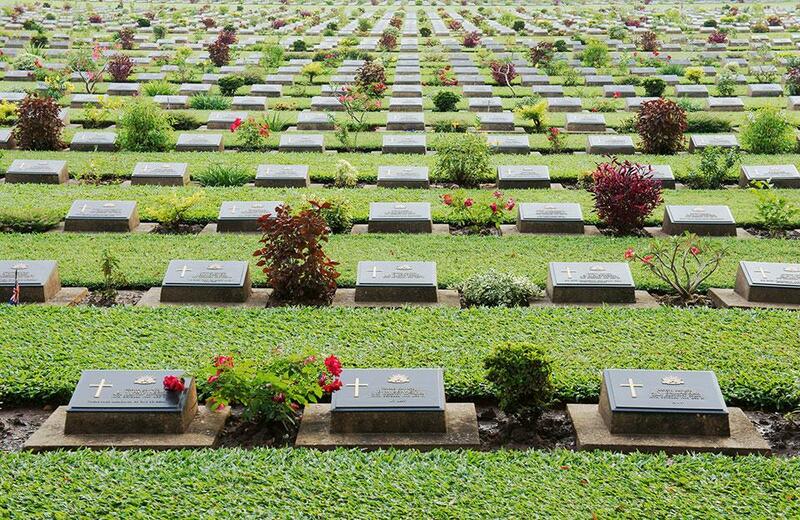 There are two war Cemeteries, the Kanchanaburi War Cemetery is the larger of the two and contains over 7000 graves mostly Australian, British and Dutch. The Cemetery is on Sangchuto road just behind the park next to Kanchanaburi railway station and is open 07.00-14.00 daily. The smaller Chung-Kai War Cemetery is on the site of a former POW camp 5 km from town and contains the graves of about 1700 British and Dutch prisoners of war. It is open from 07.00-17.00 daily. There are three war museums in Kanchanaburi with the best one being the Thailand – Burma Railway Centre located next to the Kanchanaburi War Cemetery. 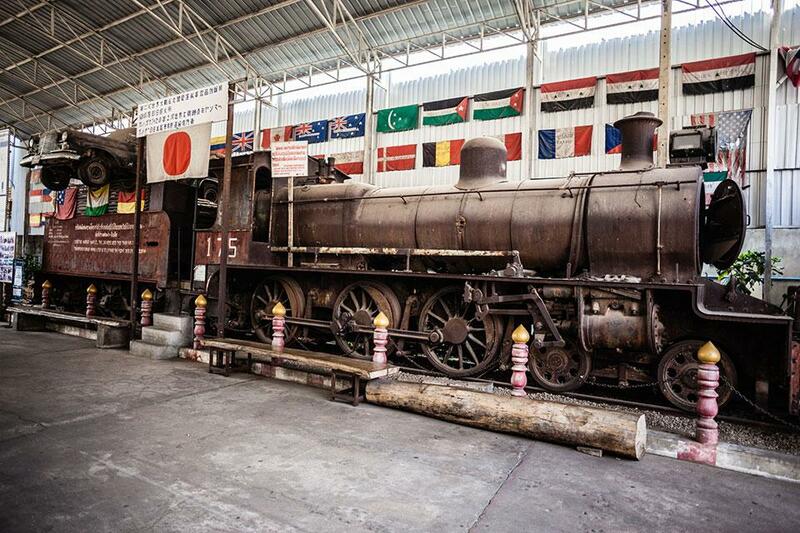 The museum mainly concerns the Death Railway construction and route as well as a history of the war in Thailand. There are many interesting artifacts such as old photos and the personal effects of prisoners as well as video and interactive presentations. The museum is open from 09.00-17.00 daily and admission is 150 baht. Near to the bridge is the World War 2 Museum though it’s more of a general Thai history museum with only a WW2 section in the basement. It does include some interesting stuff such as a collection of WW2 military vehicles, uniforms, weapons, tools, and an old steam train. Admission is 40 baht and it is open from 08.30-17.30. The third war museum in Kanchanaburi is the JEATH War Museum (though confusingly the basement museum at the WW2 museum is also called the JEATH), and is in reconstructed bamboo huts like those that the prisoners of war slept in. The museum covers the construction of the railway and contains mainly photos and paintings as well as some clothes, personal effects, and weapons. It is open from 08.30-18.00 daily and admission is 40 baht. The other WW2 site to visit is Hellfire Pass. A railway cutting that was mainly cut by hand with hammers and chisels. It was built by Prisoners of war and other Asian laborers. They worked 18 hour days to make the cutting large enough for a train to pass through. The area contained harsh terrain and slave-like conditions lead to a heavy loss of life among the workers. Today Hellfire pass is no longer part of the railway. It was excavated and preserved as a historical monument by the Australian and Thai governments. There is a memorial to those who died and a moving museum. There is a self-guided walking tour through the cutting and a 2.5 – 4km section of the railway bed. Admission is free. Hellfire Pass is 80 km’s from Kanchanaburi but is usually on the itinerary of most tours and is also accessible by bus from Kanchanaburi bus station or by train to Nam Tok and then bus. There is a bus stop at the Hellfire Pass entrance. From Kanchanaburi or Nam Tok take the Sangkhlaburi bus. The buses leave from Kanchanaburi hourly from 07.30-16.30 (air-con) for 150 baht, and at 06.00, 08.40, 10.20, 12.00 (no air-con) at 100 baht. Ask for Hellfire Pass. 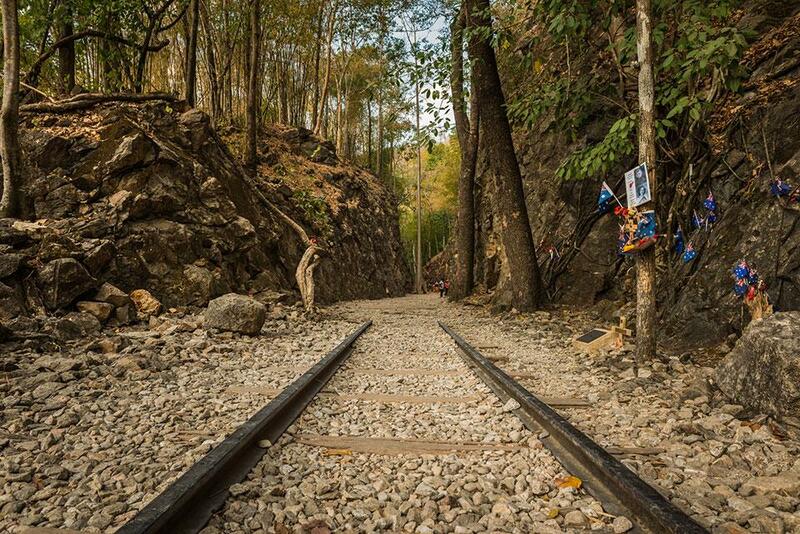 The last one departs Hellfire Pass back to Kanchanaburi at 17.00. Tours are the most convenient if you’re only on a short visit to Bangkok. They also avoid the hassle of public transport. Day & overnight tours to Kanchanaburi are popular. The tour operator will pick you up at your hotel early morning and return you early evening. There is usually a lunch included. Day tours cost between 1500 baht (group) to 3300 baht (private). Overnight tours with accommodation are also available. For a full list of tour options, click here. 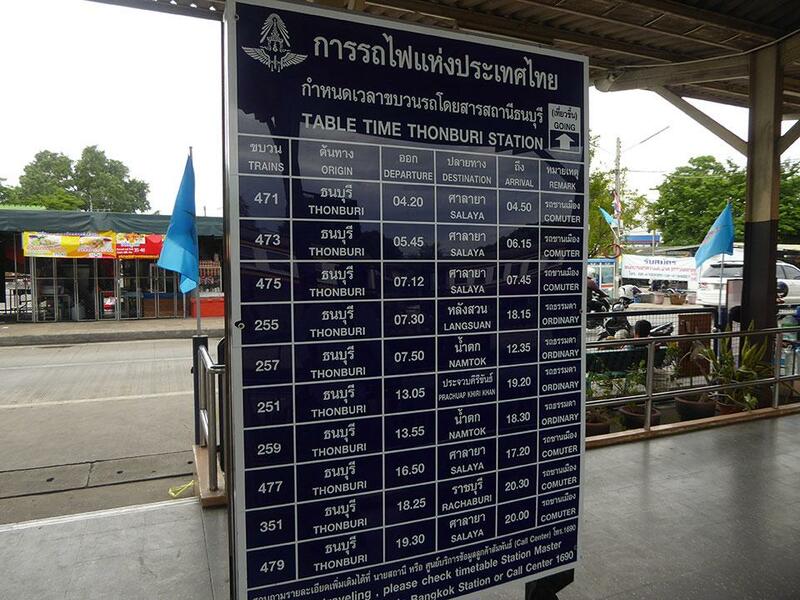 There are 2 daily trains departing from Thonburi Railway Station at 07.35 & 13.55. The journey takes 3 hours and costs 100 baht, No air-con. Thonburi Railway Station is 1 km behind Siriraj Hospital. Take the Chao Phraya Express Boat to Siriraj Pier. Returning trains leave Kanchanaburi at 07.20 & 14.45. 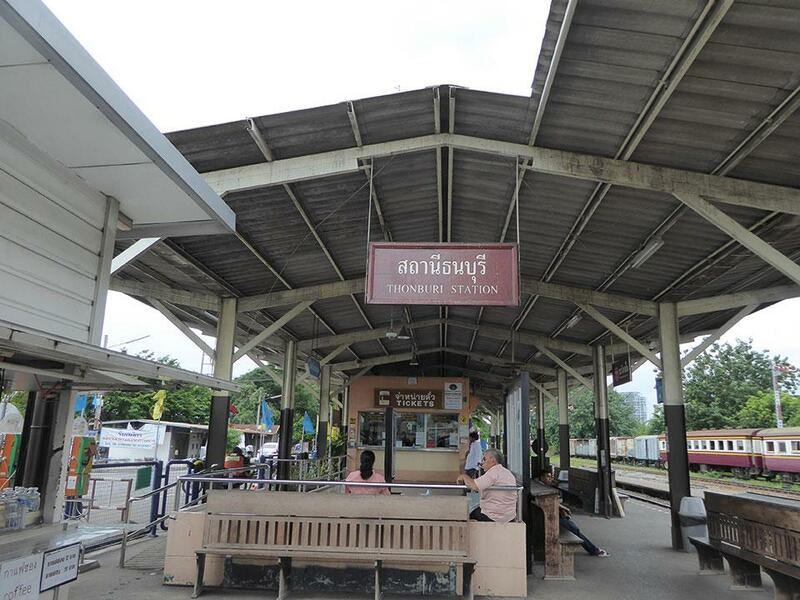 Kanchanaburi Train Station is on Sangchuto road near the War Cemetery. Buses leave from Sai Tai Mai bus station every 30 minutes from 06:00 to 20:00. They cost 95 baht and take 3 to 4 hours. Buses also depart from Morchit 2 bus station every hour from 04:00 to 18:00. They cost 120 baht and take 3 to 4 hours. The Bus returns from Kanchanaburi at similar times from the bus station on Sangchuto road. Passenger vans run the same schedule as the buses. They are usually faster than the bus. Fares are slightly higher at 120 baht. Within Kanchanaburi, there are motorcycle taxis, tuk-tuks, and rickshaws to help you get around. You can also hire bicycles or try walking.